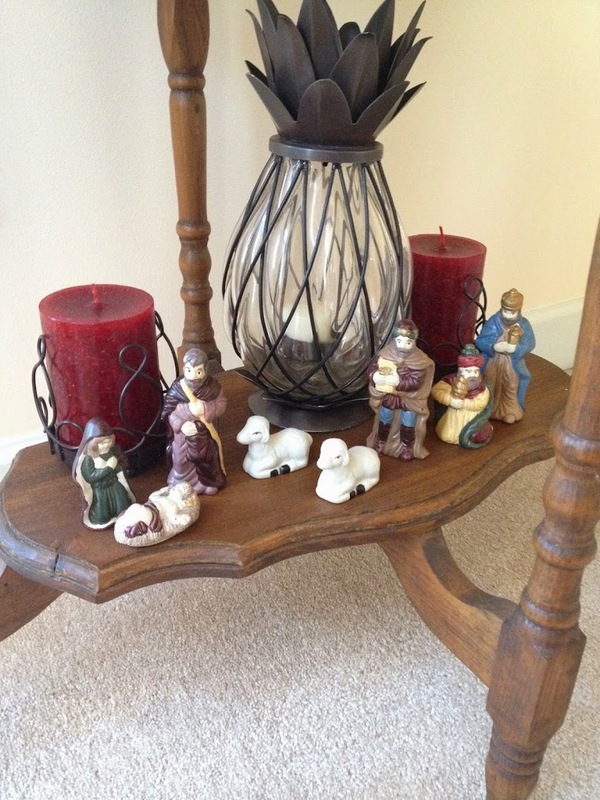 Mixing Dollar Tree Items with Antiques~It Works! The table in my entryway is a spot in my home that I love to decorate seasonally. It’s a piece that my mother once had in her antique store. I love it. For Christmas, it’s done using deep reds, gold and glass. It’s a mixture of items that I pull together to give it an overall cohesive look. I think it gives a nice welcome to our home feeling as soon as you step inside. I started by placing a strip of wide burgundy burlap and adding a strip of natural burlap overlay to use as a runner. 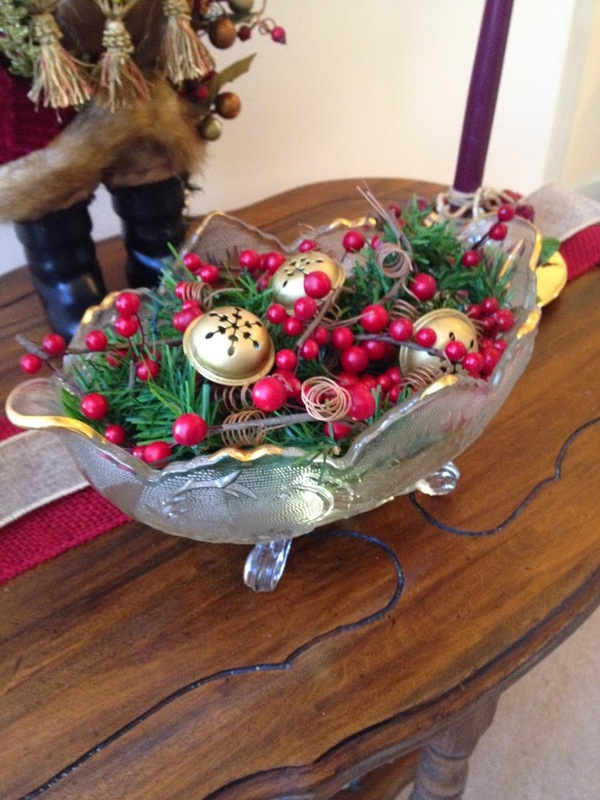 The gold trimmed antique glass bowl was a gift from my mother (I’m lucky to have lots of those gifts!) and it serves as the focal point for the table. I start by using a string of battery operated LED lights in the bottom of the bowl. I use these because they don’t get warm to the touch. The first time I did this, I used lights that needed to be plugged in and within a very short time, the bottom of the bowl was hot. Not good! I added some pieces of garland along with some berries and sprigs and topped it off with a few gold bells. Everything in the bowl is from the Dollar Tree, so, it’s definitely an inexpensive way to make the bowl festive. At night, when the lights are on, it sparkles. 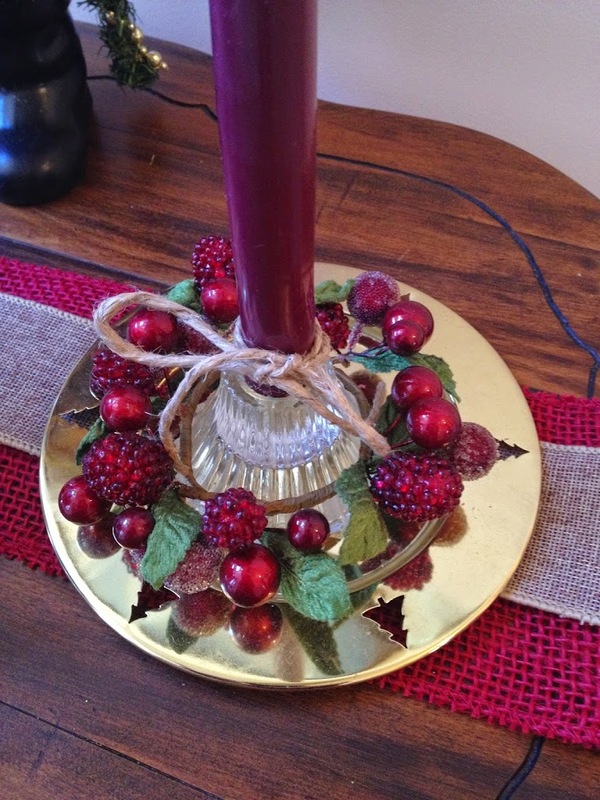 I used gold candle plates and added a circle of berries, glass holders and a burgundy tapered candles. The candle plates, glass holders and berry circles were Dollar Tree finds a few years ago. 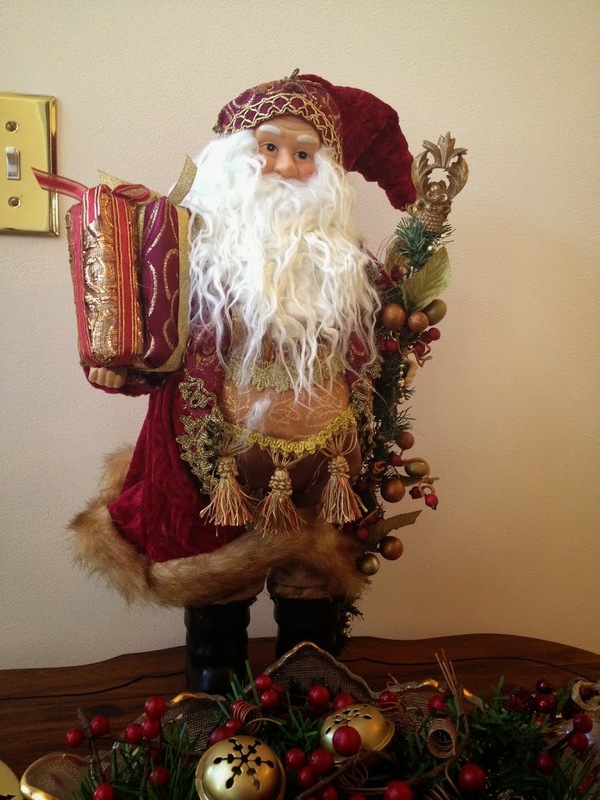 The Old World Santa in burgundy and gold fits in beautifully with the color scheme. I have many Santa figures throughout my house. If you wait until close to Christmas, every department store has them marked way down. TJ Maxx is also a great place to find them. 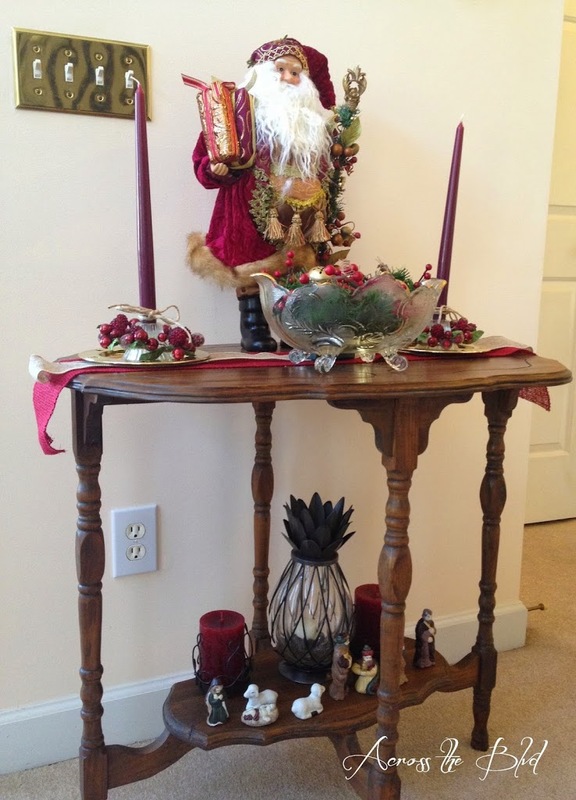 For the bottom shelf, I added a couple of burgundy pillar candles, my welcome pineapple and miniature nativity pieces that I’ve had for years and years. 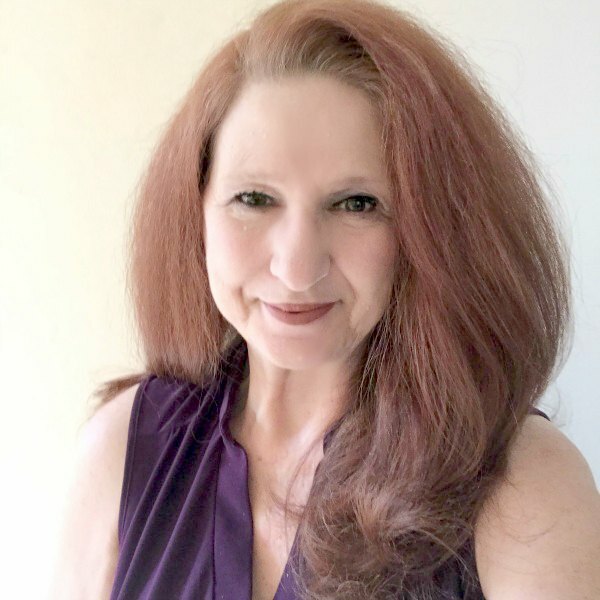 It takes very little time to put this together and by using various pieces of decor that I use in other spots of my home throughout the year, Dollar Tree items and a few Christmas pieces, I can pull the look together. I love when I can add a mixture of odds and ends to bring together the look I want. I especially love when I can use inexpensive items mixed with other items to create something pretty. 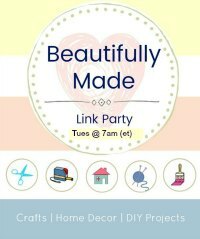 That’s always fun and a plus when decorating or crafting! Don’t you love when you can do that? Love your decorating style and the idea to mix dollar store items with traditional. Wonderful post. Thank you, Laurie. How nice of you! I’m always happy when I can use dollar store decor and blend it in. It’s all so pretty! I love the Old World Santa. 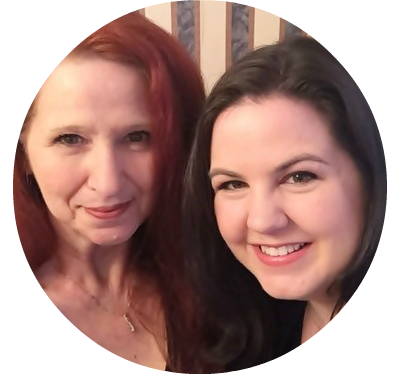 Thanks for linking up with the #HomeMatters linky. Thank you, Bonnie. I’m happy to link up at the Home Matters Party.